Click on the categories below to see J. J. Keller's answers to commonly asked questions about Compliance, Safety, Accountability (CSA) — formerly Comprehensive Safety Analysis 2010 (CSA 2010). You can also view CSA solutions. A: Any interstate carrier that has a US DOT number is covered by the CSA program, no matter what "type" of carrier they are (for-hire, private, flatbed, van, utility, construction, etc. ), what size carrier they are, or what type of vehicles they operate (CDL required versus non-CDL required vehicles). Intrastate hazmat carriers are also subject to Federal Motor Carrier Safety Administration (FMCSA) authority and subsequently CSA. Q: Are intrastate carriers affected by CSA? A: Intrastate hazmat carriers are subject to CSA. For all other carriers, it depends if their state requires intrastate carriers to get a DOT number, if they upload intrastate carrier violation and accident data into the Safetynet/MCMIS system, and if they do anything with the output of the system. What the states that require intrastate carriers to have a DOT number will do with CSA remains to be seen. Q: Will shippers, brokers, and importers (in the case of overseas containers) be held responsible for any violations (such as overhour violations caused by "shipper pressure")? Q: Will repair vendors be held responsible for violations found on vehicles that they have reported to the carriers as ready to operate? Q: Will data eventually "fall off" of the system, or will violations and crashes be counted against a carrier or driver forever? A: The measurement system uses the previous 24 months' worth of data when calculating a carrier's BASIC CSA Scores. Anything older than 24 months will not be used (for drivers it is the last 36 months of data). A: The measurement system uses the previous 24 month's worth of data when calculating a carrier's BASIC Scores. Anything older than 24 months will not be used (for drivers it is the last 36 months of data). Q: Will firing a driver that has a lot of violations in their personal data improve a carrier's CSA scores? Q: Can using the Driver Pre-employment Screening Program (note: this is a separate program that uses the same data as CSA, but it is many times involved in CSA discussions) or pulling driver-specific data out of the CSA system take the place of getting an MVR and/or doing a safety performance history on a new driver, or the annual review on an existing driver? A: No. Carriers will only be able to see the driver data; the driver's BASIC CSA Scores will be confidential. Q: What triggers an intervention? 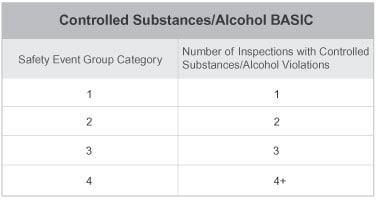 A: Interventions are selected based on the following factors: number of Behavior Analysis and Safety Improvement Categories (BASICs) percentiles above the threshold (Note: a high BASIC percentile indicates high noncompliance), a symbol due to Serious Violations, commodity hauled (e.g., passengers, Hazardous Material (HM)), intervention history, and time since last intervention. A complaint or fatal crash could also trigger an investigation. Q: Can you explain how safety event groups work in the new Safety Measurement System (SMS)? 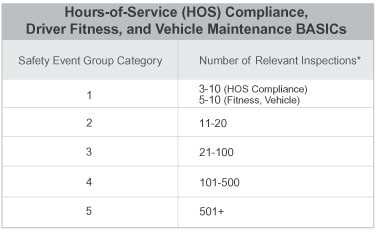 A: One of the ways the SMS accounts for the differences between motor carriers and their operations is by placing carriers in safety event groups based on the number of safety events (e.g., inspections, crashes) in which the carriers have been involved. However, the Federal Motor Carrier Safety Administration's foremost concern is safety and it accomplishes this by addressing the carriers who pose the greatest crash risk, irrespective of their industry segment. Safety event groups enable the SMS to deal with the widely diverse motor carrier population, while ensuring that similarly situated carriers are treated with the same standards. Safety event groups do not compare carriers by the commodities they haul or their industry segment. 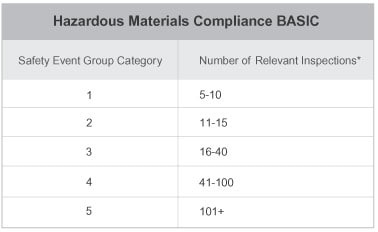 The tables below outline the safety event groups for each of the Behavior Analysis and Safety Improvement Categories (BASICs) and can be found in the SMS Methodology document. *A relevant inspection is one where the roadside inspector reviewed a particular area for evidence of violations (not all inspection types/levels look at all areas). "Combo" – combination trucks/motor coach buses constituting 70 percent or more of the total Power Units (PUs). "Straight" – straight trucks/other vehicles constituting more than 30 percent of the total PUs. Q: Will overweight violations noted on roadside inspection reports affect a carrier's CSA scores? A: No. Size and weight violations were removed from the now obsolete Cargo Related BASIC when the Methodology was updated in August 2010. A: All violations of the safety regulations appearing in the severity weighting tables and noted on a roadside inspection report during a relevant inspection will be used in the CSA Safety Measurement System. However, due to the severity weighting system serious violations will have a greater impact on a carrier's CSA scores than minor violations. A: Yes. All violations appearing in the severity weighting tables listed on roadside inspection reports during a relevant inspection will be used in the CSA Safety Measurement System, regardless of what action followed the discovery of the violation (actions such as being placed out of service, and/or being warned or cited are actions that follow the discovery of a violation).